God has been "thrown under the bus" by skeptic and believer alike due to what I see as a theological misunderstanding of one of his attributes - justice. This won't be a skeptical essay questioning God's attributes, but a good-natured challenge to prevailing theological thought (Christian) concerning God and justice. I've got a number of friends that don't believe in God. What most of us stumble over is reconciling the injustice of our world with the perception we have about God. How can we be expected to believe in a God that allows, ignores and fails to bring retribution to wrong doers? If God is indeed omnipotent, omniscient, and just why is God so indifferent or passive about justice? Skeptics can't seem to get past the problems of "evil" and injustice; it is perhaps the greatest hindrance there is to belief and one of the main sources of rebellion against religion and of God. I used to see this as a theological problem, now I view this as a problem that can be solved homiletically. Ministerial students are taught theology and homiletics while being challenged to get to know God deeply before they join the ranks of the clergy. Part of the process of knowing God is to understand his attributes. Homiletics is the study of delivering theological concepts to an audience or simply the study of preaching. It is the duty of a clergyman to communicate God's attributes and God's expectations of man and thereby challenge their congregations to mirror or imitate God in their daily lives. Whenever the man in the pew hears their minister describe the greatness of God along with the notion that God can do everything; it is easy to understand why the expectation gets established that God bears ultimate responsibility for temporal justice. The clergy joyfully delivers the great commission and rightfully extols God to be great only to leave God "on the hook" and responsible for something that the Bible doesn't claim responsibility for... . temporal justice. A clerical omission is what fuels animosity towards God and what obscures meaning in our lives. This poses an unmet homiletical problem that could be avoided by explaining what God won't do. Ministers have continually taught what God can do; they have failed to convey to people what God won't do. The difference between can and won't is a revolutionary truth waiting to be unfurled. If properly understood, this simple truth will reveal the obscure meaning of life question that the philosophers have been trying to nail down for centuries. Justice doesn't come automatically. The price tag of justice frequently requires great courage and risks to those involved in its attainment. Frankly, we have so little because we lack the resolve and are unwilling to pay its price. Ouch! There is this desire to not want to "soil our hands" and transfer tougher matters like justice over to God. We expect God to bring temporal justice; this is what God won't do! Too many Christians find it convenient to make justice a future concept (i.e. Hell, Pre-Millennial tribulation period of vengeance or a theocratic Post Millennial concept). What about now? A humanist (religious or secular) perceives this futuristic justice notion as malingering. The reality is that this futuristic justice notion aids & abets inertia enabling wrong doers. Distant retribution promises of justice don't phase the impetuous or petulant. This is where "religion is on stage" and has the opportunity to be a force for good... .if it will seize the opportunity! How? God shouldn't be "on the hook" for temporal justice - man is! The clergy need to assert this! God is spirit and he is in Heaven while man is upon the earth with much to say about what transpires on our watch! Timid homiletics allows man to feel comfortable with apathy. I fully understand the clergy's dilemma. People like to be pampered and be made to feel good. The flock can go elsewhere whenever a clergyman offends a parishioner's sense of entitlement. At this point, I would like to call a "huddle with all of our religious friends." Can a skeptic and a religious person have a meeting of the minds and agree that justice is a temporal matter that needs to be wrestled away from deity? Religion will greatly benefit because the obstacle of justice would be removed from God and humanists will have a rejuvenated non-distracted partner focused upon shared concerns. It's a win-win situation! Moral people are uneasy seeing injustice. That uncomfortable feeling inevitably provokes feelings of discomfort, which propositions us to make a choice. Rather than confronting the issue for reasons of convenience, mankind traditionally cowers away from communicating displeasure or confronting the deed. People would rather pass this unpleasant task on to God, it's as if they say "Here God, I don't want to be bothered, please take care of this for me." At this point it should be emphasized that justice is the responsibility of an ethical society whether they are secular or religious! Confronting wrongdoing comes with a price, a price that exposes the spiritual problems of greed, pride and cowardness of those who remain silent! For example, you see a friend, family member, co-worker or acquaintance doing wrong which causes suffering to another human being. You could intervene as an instrument of consciousness but instead you choose to remain silent because you are afraid of what you might lose (materialism) for speaking out. For selfish reasons, you choose to ignore the wrong. Meanwhile your consciousness keeps suppressing meaning to justify your obtuse materialism. Compromised souls have a hard time separating meaning and materialism. Is it any wonder they question what they suppress? Life is full of meaning until it is suppressed or "exchanged" if you will! The Godfather line, "It's nothing personal, its only business" will precisely illustrate the concept which stands in stark contrast to the Biblical expression of "what shall it profit a man to gain the whole world and lose his own soul." As you find yourself in the marketplace of life, I want to ask you what kind of trader are you? Are you consciously alert to personal meaning or do you barter it away as a consumer? It is in these decisive moments where the meaning of life is most evident. I hope to have brokered a deal between skepticism and religion. Biblically, ultimate justice awaits mankind at the final judgment but this doesn't absolve his creation of the responsibility of carrying out temporal justice! Rather than fighting each other over metaphysics (study of existence) and epistemology (study of knowledge), we ought to focus upon ethics (study of action). 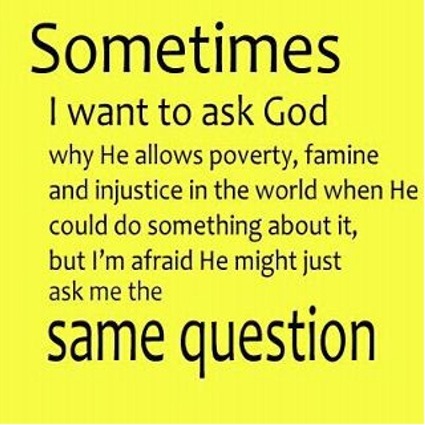 PS: I'd love to give credit for the "Sometimes I want to ask God" (yellow icon) that I added on 10-22-2011. Please inform me and I will gladly acknowledge.